Teratomas belong to the group of ovarian tumours called germ cell tumours. Teratomas contain all three germinal layers: endoderm, mesoderm and ectoderm. They are mostly benign but can be malignant. The benign variety is the most common persistent tumours of the ovary and often contains dermal tissues giving rise to hair- and sebum-containing cysts, hence the common name for them: dermoid cysts. 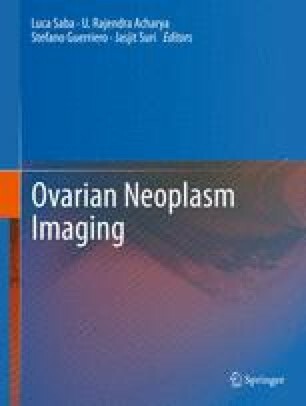 Transvaginal ultrasonography has an established role in the evaluation of adnexal masses and provides an accurate assessment of ovarian morphology. It is also well known that dermoid cysts have distinct sonographic grayscale morphological features, which can be used to accurately diagnose dermoid cysts. This chapter will cover the pathology and ultrasound appearance of the more common teratomas: mature cystic teratomas, immature teratomas and struma ovarii. The rare teratomas such as primary carcinoid and strumal carcinoid are so unusual as to be outside the scope of this chapter.